Asynt has launched its new flow-chemistry platform, the fReactor, an affordable device created to bring the advantages of flow chemistry to laboratories through easy-to-use, flexible and intuitive design. The fReactor platform comprises of 5 modules, which combine to give a reaction zone delivering a good residence time distribution. These interconnected modules are located on a metal heat-transfer baseplate which sits on conventional laboratory hotplate-stirrer. 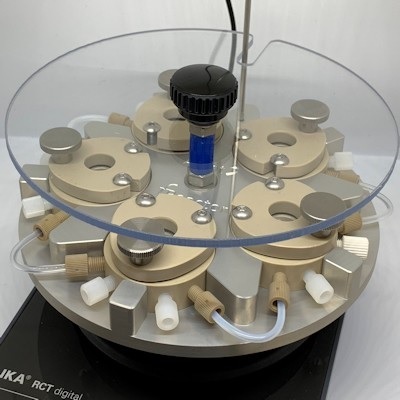 Nikil Kapur, Professor of Applied Fluid Mechanics based at the School of Mechanical Engineering, commented: "With mixing in each zone, the fReactor offers outstanding flow chemistry reaction flexibility. Multiple ports allow telescoping of reactions, sampling or integration of sensors within the reactors. Robustly constructed, the fReactor is both easy to use and simple to clean."